Protein bars provide the body with necessary nutrients and are a good alternative for the replenishment of amino acids. The content of simple carbohydrates is low and suitable for people who take care of their weight and figure. The protein bar weighing 60 grams contains 29% of plant and animal proteins mixture; it means that a consumer obtains 17,4 g of proteins by consuming one bar. The plant proteins in the mixture are represented by soya protein, rice protein and the animal proteins - whey protein, milk protein and egg protein. The higher ratio of plant proteins compare to the animal proteins (1: 0.5) ensures the hypocalciuric effect (reduction of calcium urinary excretion from the body). The main positive qualitative characteristic of utilized protein mixture is the balanced amino acid composition. The higher content of branched chain amino acids (BCAA). The product contains added BCAA. These include leucine, isoleucine and valine. There are essential amino acids; the body isnot able to create themselves. BCAA, especially leucine increase protein synthesis and decreasethe protein breakdown in the body and they have anabolic effect in muscles during recovery period after the physical activity BCAA, this is important in the process of the regeneration. The bar has low content of simple carbohydrates and low glycemic index. The high content of dietary fiber, 16 – 17 g per bar, which represents almost 68% of the daily requirement of fiber for humans. The fiber in addition to its well-known positive effects reduces the resulting glycemic index of the bar itself. 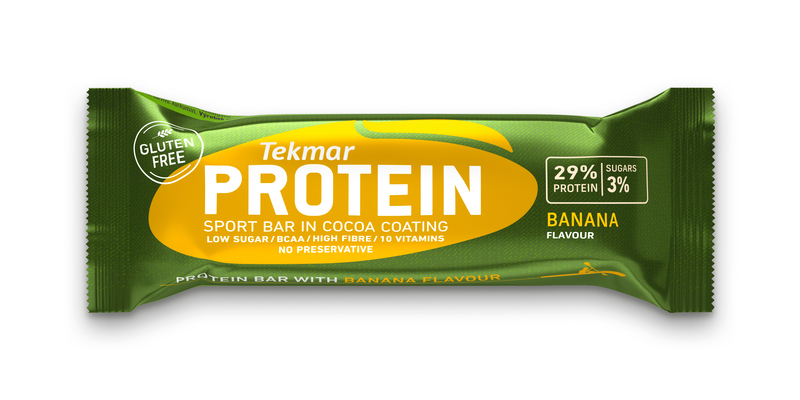 The bar contains vitamins in an amount ranging from 24 to 120% of the recommended daily requirement. The multicomponent protein product with precisely balanced content of amino acids, in accordance with body requirements, provides balanced and optimal amino acid content for the formation of body proteins. The high content of fiber has prebiotic effects and positively affects the intestinal microflora in the digestive tract. 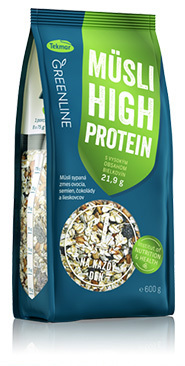 The cross combination of individual components ensures the intake of 17, 4 g of proteins, 16 -17 grams of fiber. You can find them in three flavours: banana, chocolate and cheesecake. thickener: polydextrose (fiber), mixture of plant protein (soy protein, rice protein, pea protein), dark cocoa coating (sugar, fully hydrogenated palm fat, cocoa powder, emulsifier: soy lecithin, flavouring), corn extrudaed cereals (corn semolina, rice flour, sugar, salt), dried dates, humectant: glycerol, rapeseed oil, palm fat, wheat extruded cereals (wheat semolina, wholegrain wheat flour, rice flour, sugar, salt), cocoa powder, mineral:calcium carbonate, emulsifier: soy lecithin, salt, instant coffee, L-carnitine tartrate, vitamin premix (C, niacin, E, pantothenic acid, B6, riboflavin, thiamin, folic acid, biotin, B12), flavorings. The bar based on plant proteins is a good alternative for those interested in protein nutrition. For its low glycemic index it is a popular and recommended for customers who prefer food with low energy value.You can find them in three flavours: cappuccino, cocoa nibs, chocolate and mandarine. 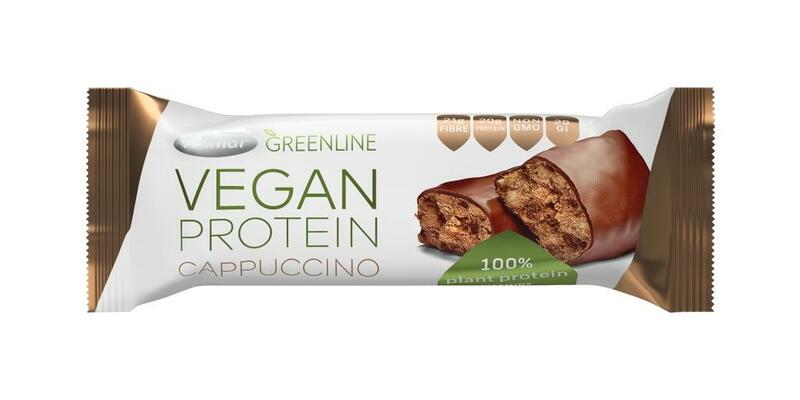 The bar is exclusively made up of plant proteins. The cross combination of soya, rice or pea proteins with 17.5% provides 5 g of pure proteins, with 78-95% digestibility. The important benefit of the bar is the fact that plant proteins reduce calcium excretion from the body (hypocalciuric effect), compared to the animal proteins which result in increased calcium excretion from the body – the bone decalcification. This fact is important to people recovering from broken bones, people suffering from or susceptible to the osteoporosis. As the energy source it contains fiber – a polysaccharide - polydextrose. It is used as a substitute for sugar. The polydextrose has a low glycemic index characterized by the prebiotic effects, promoting the growth of probiotic "beneficial" bacteria in the gastrointestinal tract and includes inulin - plant polysaccharide, which is also the source of energy with low glycemic index and with prebiotic effects. Each 40 g bar contains 8.5 g of fiber, which means it belongs to products with high content of fiber. It contains L-Carnitine, which helps with production of energy from fats (it helps to burn fat in the body and accelerates the burning of fats ingested from food), reduces fatigue and feeling of hunger. The bar contains 148 mg of calcium and the complex of E, C, B1, B2, B6, B12 vitamins, niacin, biotin, pantothenic and folic acids in an amount corresponding to 12-80% of the standard daily requirement. oat flakes, soya beans, sunflower seeds, dried raisins, dried dates (dried dates, rice flour), hazelnuts, chocolade (sugar, cocoa mass, cocoa butter, soya lecithin, flavouring), flax seeds, sesame seeds. The product is intended as a diet supplement for active consumer who prefers daily dose of balanced diet supplements with higher content of proteins and fiber. They have high content of soluble and insoluble fibers, which are able to satiate body for a long time because the fiber and complex carbohydrates act as a stabilizer of glucose. The oat flakes provide in 600 grams of dry mixture of 17.82 grams of fiber. The benefit from essential fatty acids results from the presence of ground flax seeds, which are a natural source of essential Omega-3 fatty acids and lignans, which perform important functions in the body – they reduce the risk of coronary heart disease, suppress inflammatory processes in the body, improve body recovery, help reduce production of the Cortisol – the stress hormone, they positively influence the processes related to learning and memory, and influence the development of the neural system. Flax seeds in 600 g of dry mixture ensure the content of alpha linolenic acid in an amount of 4.06 g, which is 200% of the recommended daily requirement of essential fatty acids for humans. In case of intake of recommended 75 g dose of the dry mixture it provides 0.507 grams of alpha linolenic acid for the body, which is 25% of the recommended daily requirement. The hazelnuts are also the source of fatty acids, which in an amount of 4% in the mixture provide 20 mg of Omega-3 fatty acids. The hazelnuts are a source of E, B1, B2 and B6 vitamins. The additional benefit is the concentration of lignans in flax seeds (100 times higher than in other plant sources). They are natural phytochemicals that protect cells against the harmful effects of free radicals, they have anti-carcinogenic effect. The product is suitable for people of all ages, for people who want to have a healthy diet, for active people who need to supply the body with proteins, fiber, and essential fatty acids. An important benefit of the mixture is the high content of natural fiber, lignans, proteins and essential fatty acids from flax seeds. Bielkovinová zmes (NBH 34 Balance Protein©) 27% (mliečne bielkoviny, sójový bielkovinový izolát, ryžová bielkovina, sušené vaječné bielka), zahusťovadlo: polydextróza (vláknina), kakaová poleva 18% (palmový tuk, zahusťovadlo: polydextróza (vláknina), mliečnebielkoviny, kakaový prášok 8%, emulgátor: slnečnicový lecitín, aróma, sladidlo: sukralóza), oligofruktóza, kokosový tuk, repkový olej, zvlhčovadlo: glycerol, sójové vločky, inulín (vláknina), zmes BCAA 1,3% (leucín 65%, izoleucín 22%, valín 13%), emulgátor: slnečnicový lecitín, soľ, vitamíny (C, niacín, E, kyselina pantotenová, B6, B2, B1, kyselina listová, biotín, B12), kyselina: kyselina mliečna, aróma, farbivo : kurkumín. Aminokyseliny v 100 g: Leucín 2,7 g, Izoleucín 1,3 g, Valín 1,3 g.
The most important components of the bar are active probiotic bacteria strains of lactic fermentation. The bar includes a combination of Lactobacillus acidophilus, Lactobacillus plantarum, Streptococcus thermophillus, and Bifidobacterium Lactis. It is proven that the bacteria of lactic fermentation have a positive impact on the digestive tract health, which in turn affects the entire body (Bertazzoni-Minelli and Benini, 2008). It is important to note that the bacteria of the lactic fermentation are the most effective in combination of different probiotic strains and therefore their combination in the bar will ensure a positive effect of probiotics contained in it. Lactobacillus acidophilus: it mitigates symptoms of lactose intolerance, alleviates the irritable bowel syndrome, protects against yeast infections. Lactobacillus plantarum: it has a significant anti-inflammatory effect, it reduces flatulence and abdominal pain, generally improves digestion. Streptococcus thermophillus: it improves skin condition, helps in the treatment of atopic dermatitis and psoriasis, lowers the cholesterol level and reduces symptoms of lactose intolerance. Bifidobacterium Lactis: it helps with damage caused by harmful bacteria and also helps with digestion; it is one of the most beneficial probiotics. It helps reduce the risk of diarrhea, which arises due changes in the environment when traveling abroad, it helps to eliminate constipation - increases bowel movements; it helps to reduce toxic waste in the colon. It reduces the inflammatory processes in the colon and reduces the number of the enterobacteria and clostridia. The bar contains oat flakes in an amount of 26% and the inulin in an amount of 1.5%. 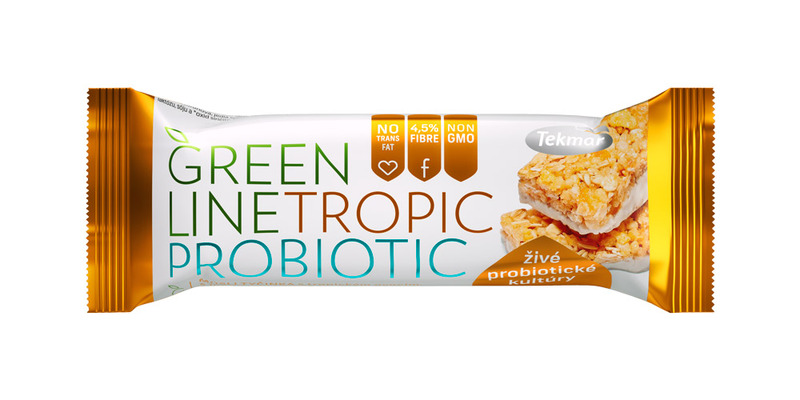 The Probiotic line contains probiotics in the dose which, when eaten one bar, exceeds the minimum recommended daily requirement of 1.109 by 130%. Since the survival rate of probiotics in digestive tract is about 10-30%, the high dose of probiotics in the bar ensures that amount of the living probiotics which passes through the digestive tract is in such amount, which is equal to recommended daily requirement. Thanks to this fact a sufficient effectiveness of probiotics is ensured in the digestive tract. The Probiotic line bar is intended for all ages for promoting and achieving of a good digestion and digestive tract health. It provides to the body sufficient amount of lactic fermentation’s probiotic bacteria in order to achieve their positive effect, which is supported in by fiber content of oat flakes and the inulin. Fiber provides conditions for reproduction and growth of probiotic bacteria in the digestive tract. 2019 © TEKMAR SLOVENSKO, s.r.o. All rights reserved.